The City of Edmonton welcomes volunteers and, at the Archives, volunteers are a vital part of our team. Information on becoming a volunteer of the City can be found on the Volunteer Opportunities site. We’re primarily the repository for the civic records of the City of Edmonton but we’re also dedicated to having a documentary legacy for Edmonton that’s as comprehensive as possible. Context is really important in Archives and the records of the City won’t mean very much without an understanding of the people, organizations and businesses that call Edmonton home. To do this, we need you! Please consider donating your personal records or those of your family. If you own a business you can donate the operational records you no longer need on a regular basis. Not only will your records help create a picture of life in Edmonton, they will also be preserved and accessible for future members of your family. If you work for an Edmonton business or belong to a local organization or club, you can ask the organization to consider donating their records. However, we need written permission from the Board or Executive in order to accept these records. 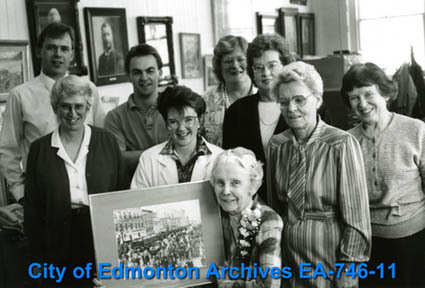 Donations to the City of Edmonton Archives are considered gifts which may be eligible for tax credit. Ownership and, if applicable, copyright is transferred to the Archives upon donation. More information on donating records can be found on our donation form. We’ve also created guidelines for organizations which include recommendations on how long to keep records and the kinds of records archives are looking for. You can also contact us about donations at 780-496-8711 or at cms.archives@edmonton.ca. Recommendations on how long to keep records and the kinds of records we're looking for.